The assassin whose very body is a weapon – Nendoroid Yami! 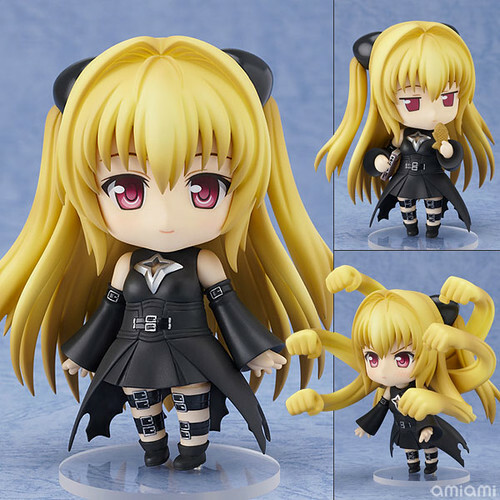 A spinoff manga of the ever popular ToLoveRu series, ‘ToLoveRu Darkness’ is currently being serialized in Jump Square, and from that series comes an adorable Nendoroid of the dangerous assassin from another world – Golden Darkness! She comes with three expressions, a typical expressionless face ideal for her personality, an embarrassed and angry looking expression and finally a blank stare. She also comes with a bag of taiyaki as well as a book to carry around with her – two things you rarely see Yami without! Last but not least, she also comes with replaceable hair parts which allow you to pose her with her hair made into a number of fists – ready to punch anyone who makes her upset! There are so many different ways you can pose her – pick whichever you like best! This entry was posted in News and tagged golden darkness, konjiki no yami, nendoroid, toloveru.